Jelly and jam are two of the most popular spreads and are consumed all around the world. These two often appear on grocery shelves side by side. The similarities are obvious when reading the labels of these products and the differences are noticeable and obvious from the time you open the container. Jelly is noted for its smooth texture. The elastic or gel like consistency is how the name is derived from and it is one of the most notable aspects of the product. It comes in many of the same flavors as jam, but it is usually made mostly from the juices of various fruits. The use of juices from fruits with the conjunction of gelling agent (fruit pectin, gelatin, etc.) allows for the consistency and smoothness which is preferred by many. Jelly is made by using a boiling technique that incorporates a water sugar mixture. Jam is more fruit than jelly. Jam takes its name from the process involved in its preparation. The preparation of jam is simple in terms of ingredients and it involves slight crushing or jamming of pieces of fruit. It is notable that fruit juice is also used and a jelly-like materials used to hold these crushed pieces of fruit. Jam is also available in many fruit flavors. For instance, you may find both grape jellies and grape jams side by side on the grocery shelf. The texture and taste of jams are less uniform than jelly. Some prefer jam because of this reason. Jam and jelly are preferred by many. Jam appeals to many fruit lovers. Jellies are also used in other foods that range from cakes to doughnuts. Texture and taste are noticeable and therefore you may prefer one over the other depending on your need and preference. lanceraa. "Difference Between Jelly and Jam." DifferenceBetween.net. 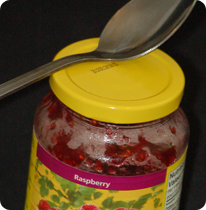 September 6, 2011 < http://www.differencebetween.net/object/difference-between-jelly-and-jam/ >.